Beautyworld offers you a revolutionary professional peeling that has been proven in treatments of different skin states. Originally, it has been developed for medicine; however, today it is the perfect method for skin peelings. Spectacular results of the skin´s natural ability for regeneration have been used for the documentation of over 40 scientific studies. Of course, the relaxation during the treatment is essential – you will be surprised how gentle the microdermabrasion feels on your skin. The skin increases the pore refining and its elasticity. The depth of lines and wrinkles is reduced significantly. The skin´s own production of collagen and elastin is activated. The skin´s absorption of active agents is optimized. As the global market leader in microdermabrasion REVIDERM set new standards. A permanent research and development play an important role for highest contentment and safety. 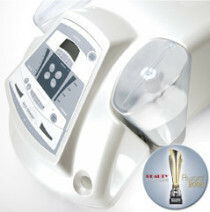 The microdermabrasion is a device for the special peeling using micro-crystals. With the multiple awarded skin peeler the dead skin cells are intensely but gently abraded. The cell division rate increases and the skin density improve. This method is of first choice and treats lines, lost of elasticity, hyperkeratosis, pigmentation disorders, dilated pores, scars, skin´s impurities as well as skin problems of the body such as stretch marks and cellulite. Already after the first session the difference is significantly noticeable, the skin has a radiant complexion with a noticeable softness in touch. Lines are visibly soothed. The complexion generally is more regular, tight and fresh. The treatment enables you to avoid “unavailability” in society. Everybody will notice your significantly fresher appearance. We will be pleased to give you consultations about the most suitable treatment for your individual needs! The microdermabrasion is a real weapon against the signs of ageing. A combination consisting of a vacuum and a controlled crystal flow generate biochemical processes that activate the skin to produce new cells. A regeneration of the tissue from deep inside to the outside is produced. This effect can be optimally combined by ultrasound. Functioning as a vascular training, it activates the microcirculation as well as the lymphatic flow. This enables the skin to absorb efficiently the active agents. According to your individual needs we apply harmonized dermo-cosmetic products, which penetrate deep into the skin and foster effectively the cellular regeneration. The rejuvenation of the skin is significantly visible after the cure treatment.